viaLibri ~ John Wisden's Cricketers' Almanack for 1895 - 1895 Wisden Rebound Like Hardbacks , Special. 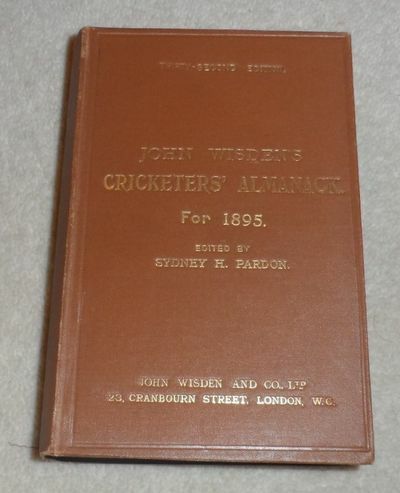 John Wisden's Cricketers' Almanack for 1895 - 1895 Wisden Rebound Like Hardbacks , Special. This is a very special 1895 Wisden, rebound by Wisden in the middle of the 20th Century to mimic an 1896 hardback, a quirky Wisden that will appeal to some. The similarities to a hardback are that the paste downs are yellow (with a Liverpool cricket club stamp) , the gilt on the covers and spine are identical to that of an 1896. It is slightly smaller by 1/8th inch , smoky top to page block and severe foxing around photo plate, the uniqueness is what will appeal. Hard to price up but Gorringes sold a similar copy (spine less like an 1896) for £750+20% and selling for less than we purchased it for.